Agouti signalling peptide, a product of the Agouti gene, is a peptide consisting of 131 amino acids. Its discovery was published in 1994 in the scientific journal Nature where its functional properties were described. It acts as an inverse agonist at melanocortin receptors, to be specific MC1. It is produced by the Agouti gene ASIP. In mice, the agouti gene encodes a paracrine signalling molecule that causes hair follicle melanocytes to synthesize the yellow pigment pheomelanin instead of the black or brown pigment eumelanin. Pleiotropic effects of constitutive expression of the mouse gene include adult-onset obesity, increased tumor susceptibility, and premature infertility. This gene is highly similar to the mouse gene and encodes a secreted protein that may (1) affect the quality of hair pigmentation, (2) act as an inverse agonist of alpha-melanocyte-stimulating hormone, (3) play a role in neuroendocrine aspects of melanocortin action, and (4) have a functional role in regulating lipid metabolism in adipocytes. Agouti signalling peptide adopts an inhibitor cystine knot motif. 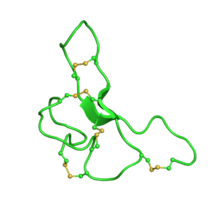 Along with the homologous Agouti-related peptide, these are the only known mammalian proteins to adopt this fold. 1 2 McNulty, J. C.; Jackson, P. J.; Thompson, D. A.; Chai, B.; Gantz, I.; Barsh, G. S.; Dawson, P. E.; Millhauser, G. L. (2005). "Structures of the Agouti Signaling Protein". Journal of Molecular Biology. 346 (4): 1059–1070. doi:10.1016/j.jmb.2004.12.030. PMID 15701517. ↑ Lu D, Willard D, Patel IR, Kadwell S, Overton L, Kost T, Luther M, Chen W, Woychik RP, Wilkison WO, et al. (October 1994). "Agouti protein is an antagonist of the melanocyte-stimulating-hormone receptor". Nature. 371 (6500): 709–802. doi:10.1038/371799a0. PMID 7935841. ↑ Kwon HY, Bultman SJ, Löffler C, Chen WJ, Furdon PJ, Powell JG, Usala AL, Wilkison W, Hansmann I, Woychik RP (October 1994). "Molecular structure and chromosomal mapping of the human homolog of the agouti gene". Proc. Natl. Acad. Sci. U.S.A. 91 (21): 9760–4. doi:10.1073/pnas.91.21.9760. PMC 44896 . PMID 7937887. ↑ Wilson BD, Ollmann MM, Kang L, Stoffel M, Bell GI, Barsh GS (February 1995). "Structure and function of ASP, the human homolog of the mouse agouti gene". Hum. Mol. Genet. 4 (2): 223–30. doi:10.1093/hmg/4.2.223. PMID 7757071. Millington GW (May 2006). "Proopiomelanocortin (POMC): the cutaneous roles of its melanocortin products and receptors". Clin. Exp. Dermatol. 31 (3): 407–12. doi:10.1111/j.1365-2230.2006.02128.x. PMID 16681590.